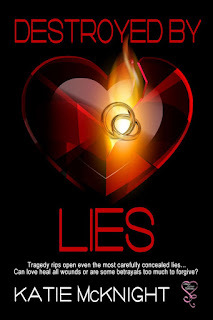 I am now booking a two week tour for Destroyed by Lies by Katie McKnight. This is an 82k Romantic Suspense novel. Tour dates: Sept 7 - 18. Looking for spotlights, interviews, reviews, and guest posts. If you would like to review, I have pdf available. More information is below, if you would like to sign up for this tour please email me with the date you can post as well as the format you would like. Tara’s marriage began to deteriorate soon after it began. As her fifth wedding anniversary arrives, Tara is determined to fix the damage and rekindle the love affair. Brad could not wait for his military deployment to end so he and his fiancé could begin their lives together. His future plans crumbled the afternoon he found his fiancé in the arms of another man. Unwilling to risk further heartache, Brad abandons his dreams of starting a family and focuses his energy on his career. Elizabeth struggled with infertility for years. Her obsession with having a child almost cost her the love of her life. After a brief separation and personal heartbreak, Elizabeth is ready to start anew. Tom has made a lifetime of bad decisions. After years of dishonesty, he’s prepared to clean up his past and move forward with the woman he loves. A late-night accident yanks all four characters out of their comfortable lives and into a world of secrets, lies and heartbreak. Will the deceit destroy their happiness? Will any of the relationships survive? Laura waved Tara and Charlotte past the scene in the waiting room and led them into the elevator. The three women did not speak until they arrived to the administrative wing. Laura’s office contained an oblong glass desk covered with folders and computer equipment. Nestled in the corner of the room were a dark, wooden table and chairs. Tara and Charlotte each took a seat at the table while Laura relocated a large, silk floral arrangement from the center of the table to the floor. “Sure.” Charlotte opened her purse and dug through her wallet. “Here it is.” She handed it to Laura. “What is your relationship with Thomas Steffen?” She asked Tara. “I’m his wife.” She removed her driver’s license from her wallet and slid it to Laura. The women sat in silence for several minutes while Laura copied information to the legal pad. “What?” Charlotte and Tara responded in unison. “I can’t provide the identity.” Laura interrupted. Now on Tour - Burning Submission by J. Richards!